This page deals with common issues in running the analysis. For issues with installing or running the software please raise an issue on github. Then your networkx package is out of date. Its version needs to be at >=v2.0. One or more times. This is triggered if \(5 \times 10^5\) edges or greater than 40% of the maximum possible number of edges have been added into the network. This suggests that the boundary is too large including too many links as within sample. This isn’t necessarily a problem as it can occur at the edge of the optimisation range, so will not be the final optimised result. However, if you have a large number of samples it may make this step run very slowly and/or use a lot of memory. If that is the case, decrease --pos-shift. This is an error where the mash output order does not match the order in stored databases (.pkl). Most likely, the input files are from different runs, possibly due to using --overwrite. Run again, giving each step its own output directory. Means that samples present in --distances and or --ref-db are not present in the loaded network. This should be considered an error as it will likely lead to other errors and warnings. Make sure the provided network is the one created by applying the --model-dir to --distances, and that the same output directory has not been used and overwriten by different steps or inputs. 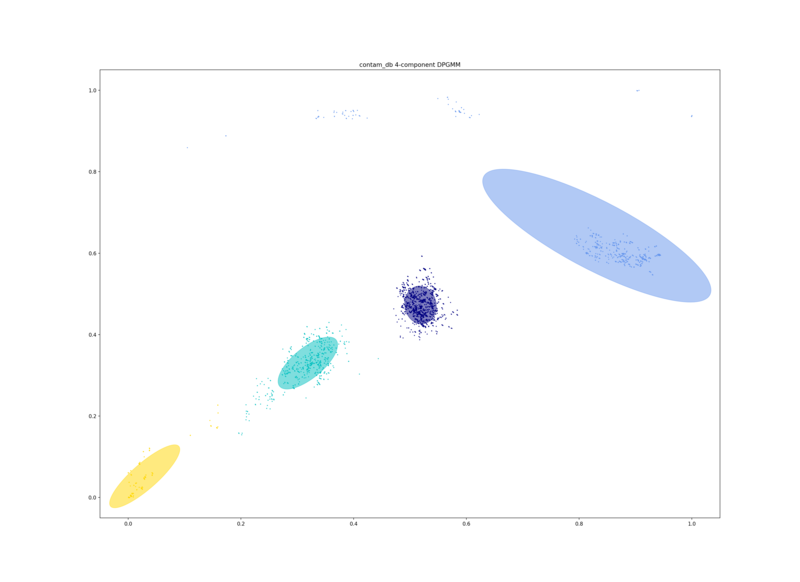 Mean that a single cluster in the original clustering is now split into more than one cluster. This means something has gone wrong, as the addition of new queries should only be able to merge existing clusters, not cause them to split. Most likely, the --previous-clustering directory is inconsistent with the --ref-db and/or --model-dir. Make sure the clusters are those created from the network being used to assign new queries. If you want to change cluster names or assign queries to your own cluster definitions you can use the --external-clustering argument instead. When using in the --create-db mode a straight line fit is required. Make sure to run with the --plot-fit option, which will randomly choose a number of sample pairs to plot the relation between k-mer distances and core and accessory fits. To get a sensitive estimate of accessory distance independent from core distance, a small a k-mer size as possible needs to be included in the fit. However, for longer genomes too small a k-mer size will result in biased estimates of distances as small k-mers will match at random. A --kmer-step of four is usually sufficient, but drop this to two or three to give the best accuracy. A key, followed by its value (space separated). mean0 and mean1 define the points (x,y) to draw the line between, and start_point is the distance along this line to draw the initial boundary (which is normal to the line). If you add the --cytoscape option when running --fit-model _cytoscape.graphml and _cytoscape.csv files will be written to the output directory. 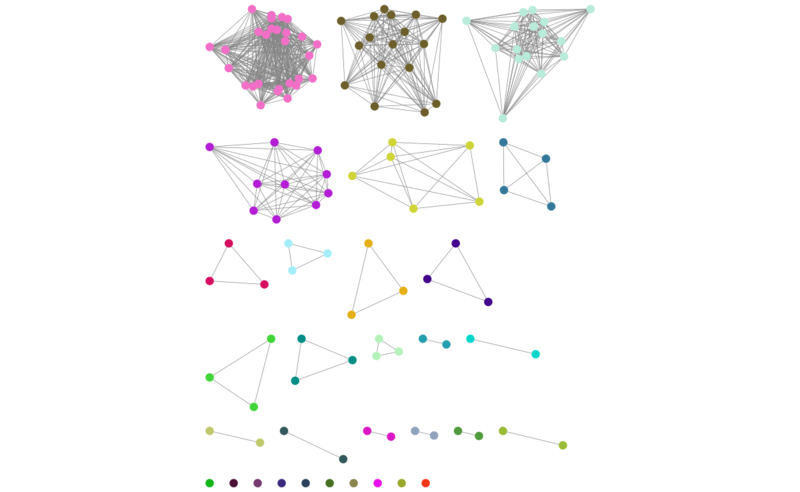 Open cytoscape and drag and drop the .graphml file onto the window to import the network. Import -> table -> file to load the CSV. Click ‘Select None’ then add the ‘id’ column as a key, and any required metadata columns (at least the ‘Cluster’ column) as attributes. Make sure ‘Node Table Columns’ is selected as the data type. In some cases, edges which are between strain links may have been erroneously included in the network. This could be due to poor model fit, or a poor quality sequence. 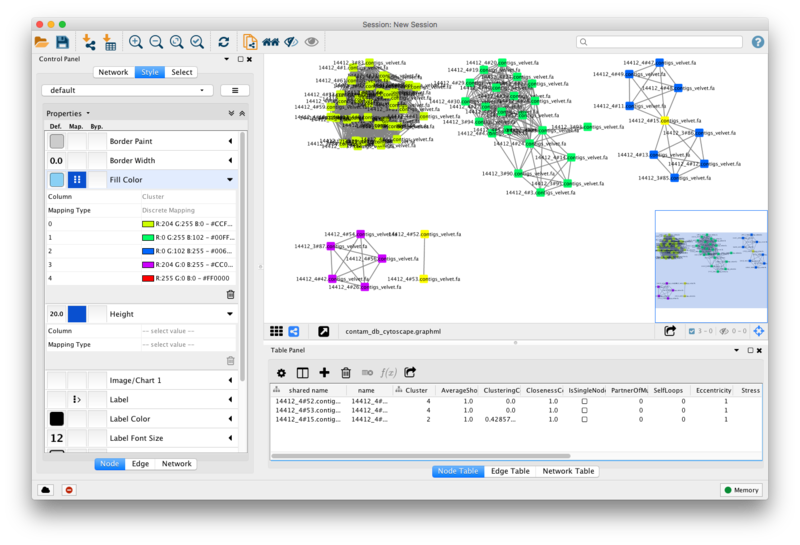 Use Tools -> NetworkAnalyzer -> Analyze Network to compute information for each node and edge. It may help to analyze connected components separately. They can be split under Tools -> NetworkAnalyzer -> Subnetwork Creation. The incorrect node in question has a low CluteringCoefficient and high Stress. The EdgeBetweeness of its connections are also high. Sorting the node and edge tables by these columns can find individual problems such as this. In t-SNE an embedding of the accessory genome distances is found which represents local structure of the data. 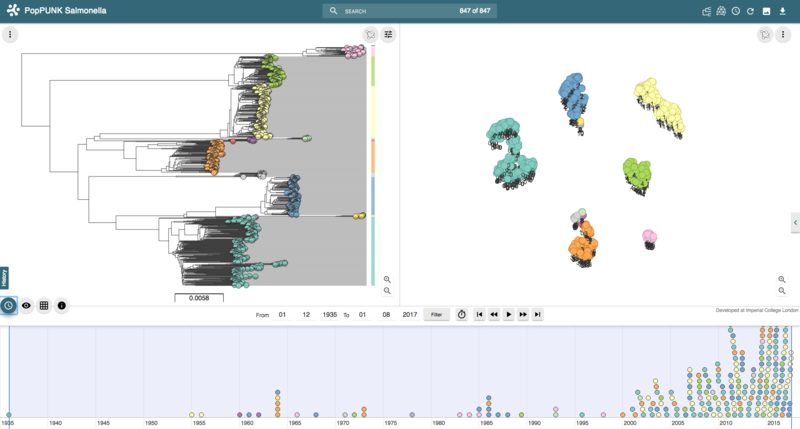 Isolates with similar accessory content will visually appear in clusters together. The perplexity sets a guess about the number of close neighbours each point has, and is a trade-off between local and global structure. 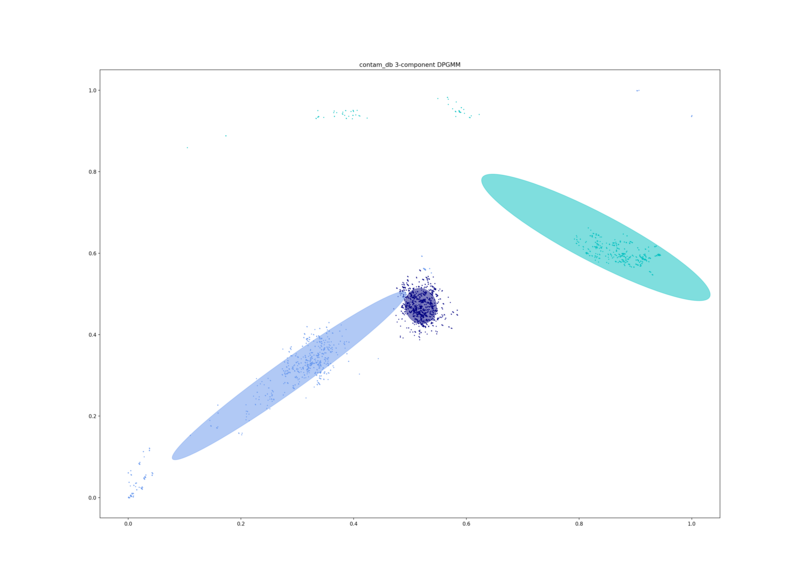 t-SNE is reasonably robust to changes in the perplexity parameter (set with --perplexity when creating microreact output with --microreact in the``–fit-model`` mode), however we would recommend trying a few values to get a good embedding for the accessory distances. There is a good discussion of the effect of perplexity here and the sklearn documentation shows some examples of the effect of changing perplexity. In this example we analyse 76 Haemophilus influenzae isolates. One isolate, 14412_4_15, is contaminated with 12% of reads being Haemophilus parainfluenzae and a total assembly length of 3.8Mb. It should be removed before input, but its presence can also be found with PopPUNK. The best thing to do is to remove the poor quality isolate, or if possible remove the contaminated reads/contigs from the assembly. The contaminated node appears when ordering by ClusteringCoefficient, Stress or TopologicalCoefficient, and its edges appear when ordering by EdgeBetweeness. 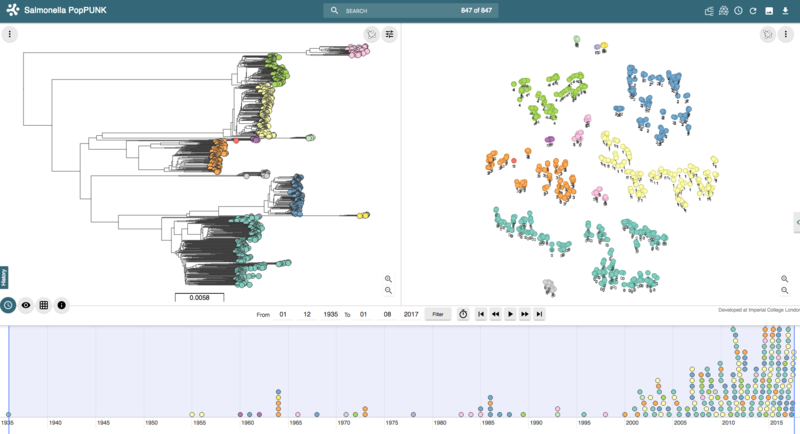 It can be seen highlighted in the top right component, connecting two clusters which otherwise have no links. It can be removed, and components recalculated in cytoscape directly, though removal from the PopPUNK database is best. The second largest cluster is also suspicious, where there are few triangles (low transitivity) and the nodes involved have high Stress. This is indicative of a bad fit overall, rather than a single problem sample. This will remove the samples from the strain_db.dists files, from which --model-fit can be run again. Add --threads – they are used fairly efficiently throughout. When running --create-db with many threads, add the --no-stream option. This will trade-off memory for disk usage, as it seems that many threaded mash dist output cannot be processed as fast as it is produced. 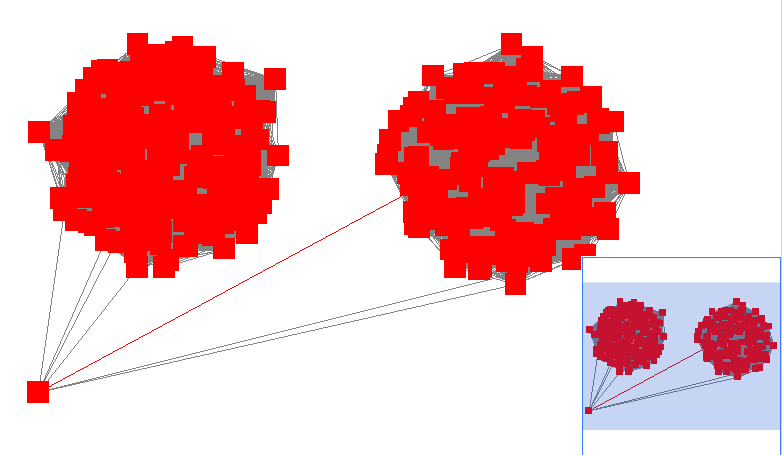 In --refine-model set --pos-shift 0 to avoid creating huge networks with close to \(N^2\) edges. Mixture models normally need to be pruned. In --refine-model you may add the --no-local option to skip that step and decrease run-time, though gains are likely marginal. Use --rapid-nj, if producing MicroReact output. Another option for scaling is to run --create-db with a smaller initial set (not using the --full-db command), then use --assign-query to add to this. © Copyright 2018, John Lees and Nicholas Croucher Revision 600840da.